Last night, we had approx. 14 Bass Clubs reps in attendance. This meeting was more or less to solidify the previous Anglers Excellence awards nominations, along with any Club that produced or help with a Kids Fishing Derby and some form of instructional session for the kids and parents. Rashawn Lewis- 1st Vice President (South Jersey Hook This! Al Franchetta- Secretary (Cumberland County BassMasters)- N/A running late/Meeting over by time in area. *Approval of December 19, 2018 General Meeting minutes as documented in handout. 1. Vote on Youth Activity Award submissions. 2. Final Angler Excellence Award nominations due. * Financial report- Balance of $254.48 after expenses related to the Budgeted 2019 Flea Market Paid out. * So far 11 Tables reserved Inside and 2 Outside for Flea Market. * Club Membership dues are do. SJHT was exempt due to winning 2018 Bass Bowl. * Nothing New to report. * 2nd Director: Mike G.
- Nothing New to Report. * 1st Vice President: Rashawn L..
- POC for Delaware Fish and Wildlife wanted me to communicate that Clubs that fish any Delaware Lakes in 2018 should report there Tournament results as that info. is used in the stocking\Health and Well being of these fisheries, and future improvements. * Newton Creek Water Shed Association- I attended a meeting over at the Cooper River Boat House where a representative from Rutgers-New Brunswick was on hand to discuss "Managing Storm Water in the Newton Creek Watershed" Presented by Christopher C. Obropta, Ph.D., P.E. on Tuesday, Jan. 15, 2019. Some very good information presented along with Slides that I will append at the end. Latest Dredging News: Email Notification that Dredging will not begin till July 1, 2019, due to timeframe for Bass Spawning periods April 15-June 15, 2019 and turtle hibernation which is currently going on now. * Nothing else to Add. 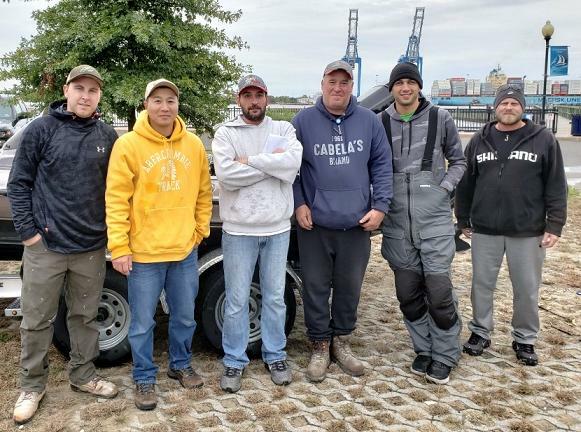 - Ike Foundation- Key Dates- Jan 27, 2019 Dinner; April 27- Hook Em' Early; Aug 8th-10th, 2019 Delaware River Event. * Exec. Board Meeting Discussions regarding Anglers Excellence awards and the reduction of certain categories as many clubs do not currently fish those formats. * Another category still being discussed is a Lunker Smallie category along with a category for Kayakers measuring there biggest Bass. - MaryAnne Franchetta, Mike Riordan, and Me. - Review of current database and POC's will be conducted come Feb. 5th 2019 as Guidance Counselors, Science Teachers, and Environmental committees change out. Insuring the Email addresses, Previous POC's are still valid, and key Public\Private\Paraochial Schools notification interest are uptodate is pertinent. * Mike R. donated $100.00 towards this years 2nd Scholarship fund. Greatly appreciated. * Continue planning for fishermen's Flea Market. * Requesting each member club donate 3 Freshwater Lures and 3 Salt water lures to go into this years tackle box. * Weigh-In Trailer- Bill of Sale and Registration has been officially received from J. Hoban and now back with SJBCA under F. Lentz name. Come March 1, 2019, a trip to DMV to switch over will occur via Fred. * Vote for annual youth activity awards. 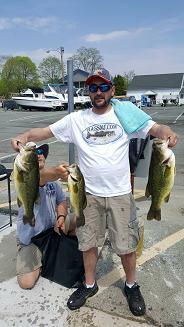 - Congrats "South Jersey Hook This" on winning the Major Activity Awards for supporting "Winslow PD Cops & Boppers Kids Fishing Derby Event" held on Sat. Oct. 20, 2018. $50.00 will be donated to the Club.. Our Packet, Pictures, Write-up, and detailed explanation of the event along with media Feedback was Dead On. * Announce Angler Excellence Award Winners. 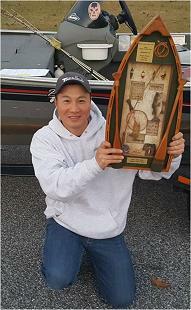 - Congrats Rob Masterson on Heaviest 3 Bass at 13.67lbs on the Northeast River, MD. - Pocomoke River, Hopatcong, Northeast River, Greenwood, Nanticoke, and Conowingo Dam are this years nominees. * Present plaques to 2018 Fishing Excellence Award Winners, Youth Activity Award winners, & 2018 Bass Bowl Winners. * Vote on Location of 2019 Bass Bowl. * Continued planning for Fisherman's Flea Market to be held Sat. March 2, 2019) at the Millville Elks Lodge. Any SJHT member is welcome to attend, meet up, or travel down with me to the monthly SJBCA meetings. The inner and outer workings is open to anyone interested in learning more about these meetings. Note: 2018 SJBCA Winning Bass Bowl Team Members- Save the Date to come on Wed. Feb. 20, 2019 at 8pm to receive your SJBCA/SJHT Bass Bowl Champions Plaque down at the 4th Ward Club-House. 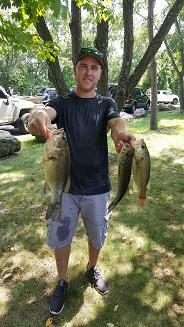 Rob M. also won the 3 Bass Category for Heaviest Limit down on the Northeast River. * As a Club, We also won the Major Category of the Youth Activity Award for supporting Winslow PD Cops & Boppers Kids Fishing Derby Held at Oak Pond located in Winslow NJ. A plaque and $50.00 check will go to the club which in turn goes to benefiting future events held by these types of activities. * If unavailable, please let me know. That's all I have!! Lets come out and represent at the next SJBCA meeting. Managing Stormwater in the Newton Creek Watershed slides.